This past week on “Real Housewives of Alabama,” Kate drove to the big city, hopped a plane to Orlando, and spent a kid-free weekend at the beach with her college girlfriends(!!!) Yes, it’s true- for a glorious 72 hours, there were no diapers to change, jobs to clock in to, dirty boxer-briefs to pick up off the floor. Just 4 gals, the crashing waves, and a super classy box of red wine. 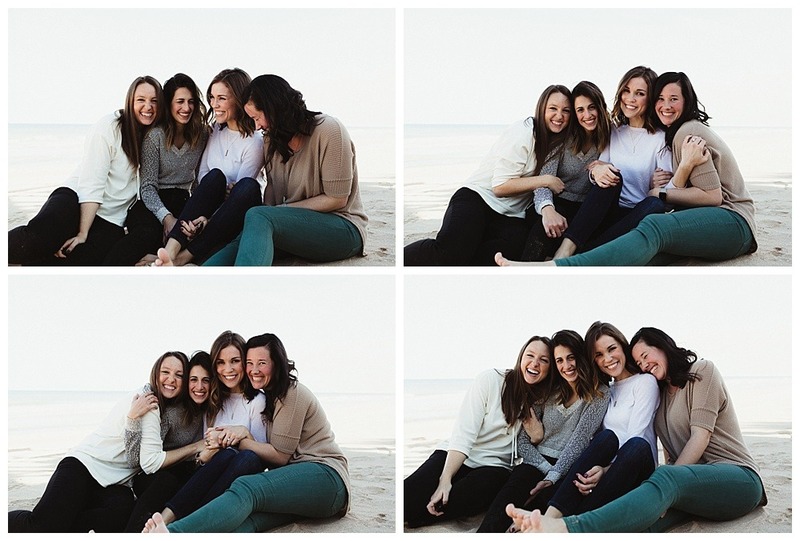 With no deadlines to meet or tiny humans to tend to, the hours of the day passed lazily with cozy blankets and rabbit trails of conversation that usually began with “Remember when…?” and ended in fits of laughter. Time away is good for the soul and helps me to dust off little bits of myself that ordinarily hide on the bookshelf. These girls have been around for over a decade now, and every time we see each other, I’m always reminded how good it feels to be known. What would we do without the people in our lives who love us without agenda and in spite of ourselves? Bless. 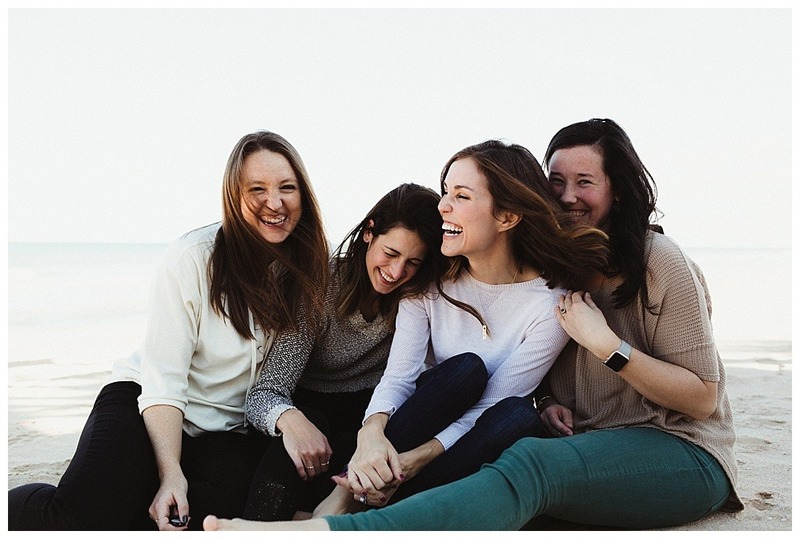 One of my little beach bunnies, Abby, recently started a lifestyle blog called The Hollar-Days where she shares DIYS, painting tutorials, and snippets from her life as wife and mama. Abby shares my love of delicious food and beverages, so when she suggested we plan a little beachside picnic for our girl’s trip, I was all in. A few cookies and cocktails later (you know, for “testing purposes”), we came up with a few treats that I’m thrilled to share with you. Exhibit A: lavender vanilla bean sugar cookies. 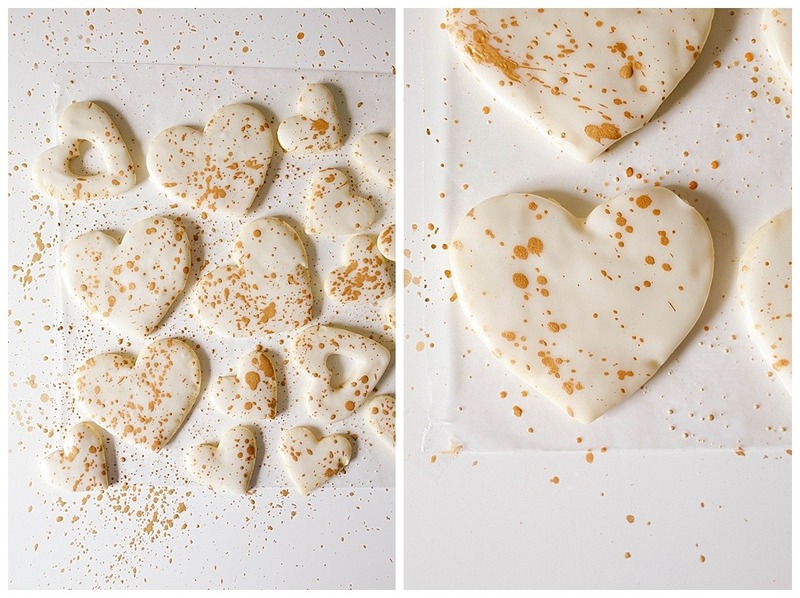 These cookies are quite similar to my favorite cutout sugar cookies that I shared with you all a while ago, except they are speckled with bits of vanilla bean and dried lavender. I adapted my favorite icing recipe so that you can simply dip the face of the cookie in the glaze, and I have to say, it makes preparing these cookies easy breezy. While lavender vanilla bean sugar cookies are certainly special enough on their own, we decided to fancy them up a bit by splattering them with little gold speckles. I was inspired by a recent article in Martha Stewart Magazine and knew I needed an adaptation of my own. Maybe the girliest, most lovely little cookies of all time! 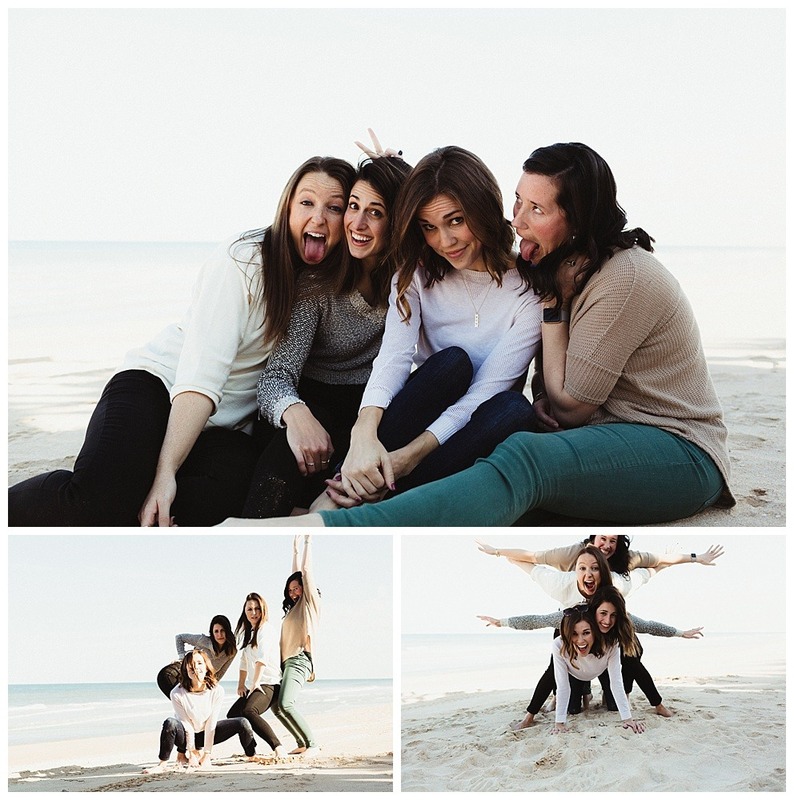 Cookies are great, but sometimes, a little time away with your bests is just what the doctor ordered. Give these lavender vanilla bean sugar cookies a try, and share them with your favorite gals (or guys!) this coming Valentine’s Day. You can also find a few other delish cookie recipes to share with your besties here. Oh, and PS, I’m chomping at the bit to share ALL THE CHOCOLATE RECIPES with you guys throughout the month of February, so hold on to your hats, belts, and everything else, and prep your gullet for some melt in your mouth goodness. It’s going to be a delicious 28 days for us. Cheers to you! 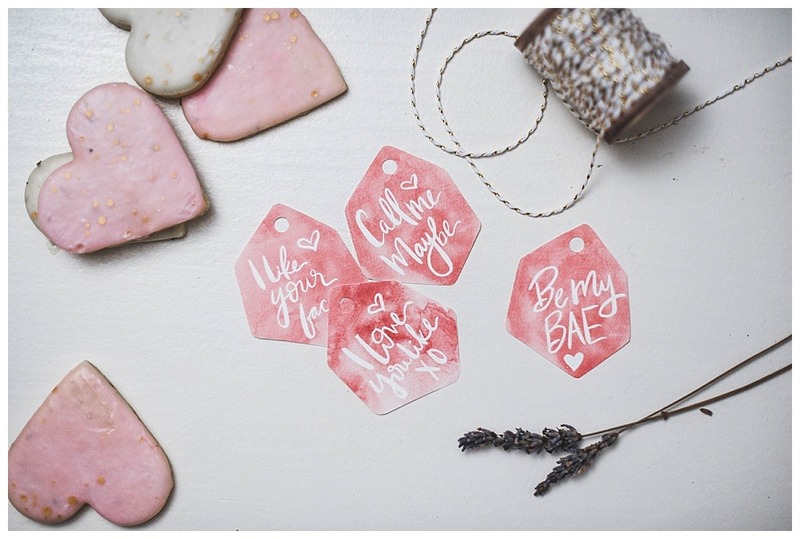 For a link to Abby’s cocktail recipe and Valentine’s gift tags, click here! To check out the culinary lavender I purchased, click here! To find lustre dust, click here! 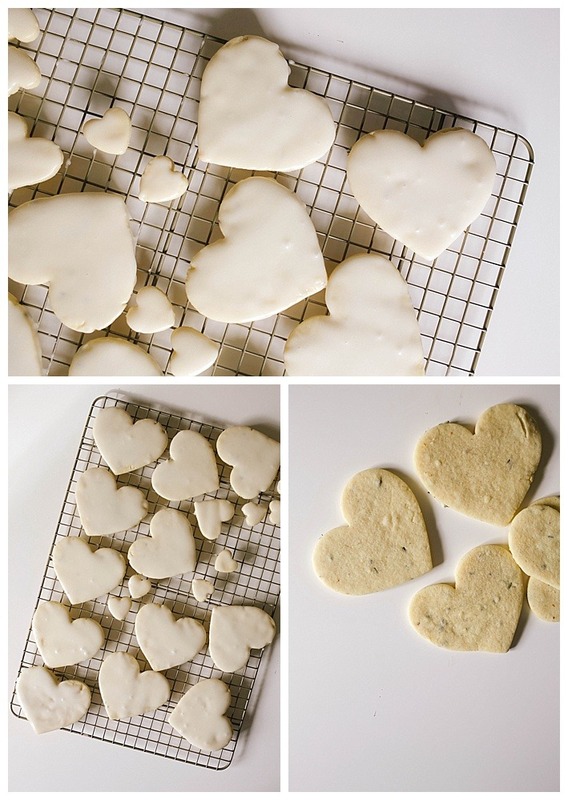 The lavender vanilla bean sugar cookies are soft cutout cookies scented with dried lavender and vanilla bean. 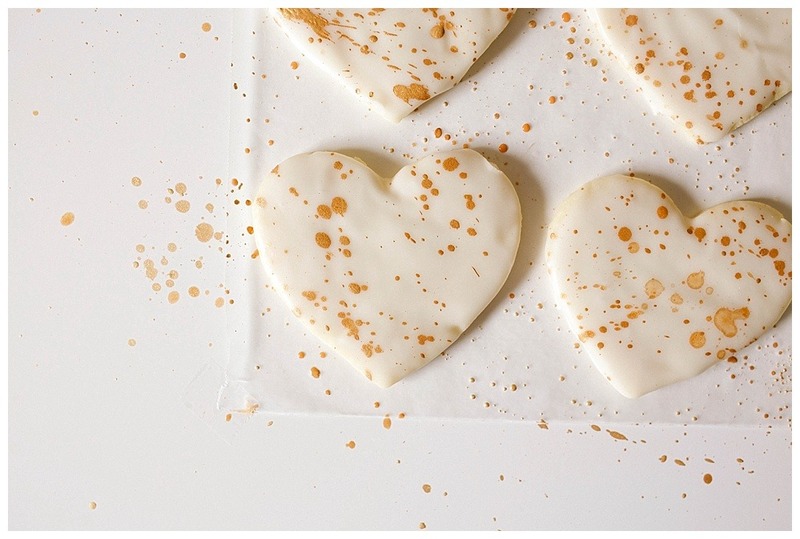 Decorated with a glaze and a gold splatter, the tutorial for these cookie is easy and fun! Grind the lavender slightly using a food processor, coffee grinder, or mortar and pestle. Combine the lavender and remaining dry ingredients and set aside. Add 3 tablespoons of the milk and the extract, whisking until combined. Continue to add milk until it is the right viscosity. You will want thicker frosting for piping. To test viscosity, run your whisk or a knife through the bowl of frosting- your frosting should slowly move back together until you can’t see any trace of the whisk any longer. This process should take about 6-8 seconds. If the frosting is too thick, it will not pool back together, and if it is too thin, it will pool back together too quickly. Add more milk for a thinner icing and more powdered sugar if your icing becomes too thin. When ready to frost your cookies, cover your work space in wax paper. Set out some cookie racks to place your frosted cookies on. To frost, hold each cookie by its rim and dip the face of it directly into the icing. Allow any excess to drip off the sides. Add more milk or sugar, if desired, to modify the consistency of your icing. Cover your workspace in parchment or wax paper. Lay dry, frosted cookies out on the paper. Scoop 1/4 teaspoon lustre dust into a small dish and add 1/8 teaspoon of extract or liquor. Stir until the lustre dust is all dissolved. You can add an additional 1/8 teaspoon of liquor, if needed, but take care to not add too much, as this can cause your sugar icing to dissolve and bubble up. Dip a silicone basting brush in the liquid gold, and dab any excess off on the side of the bowl. Do a test splatter on a paper towel or extra sheet of wax paper. To splatter, I hold my silicone brush parallel to the work surface, draw back slightly at the wrist, and then fling the brush downward, like you’re swatting a fly or hitting a drum. The size and shape of your silicone bristles can change the way your splatter looks, so do a few test splatters before you move to your cookies. Once ready to decorate your cookies, splatter then in the same manner you did your tester and allow to dry completely before packing or storing. For a deeper, more concentrated gold color, use as little alcohol as you can. The more liquid in the splatter, the lighter it will be. I tested this technique using a natural hair basting brush and it was not successful. I recommend a silicone brush for best effect. If desired, you can pipe the icing on your cookies for a more polished, perfected look. There is a tutorial for this in the cookies archives of my blog. You will need you frosting to be a bit thicker. Be sure to purchase food grade, edible lustre dust. I purchased mine on Amazon! Wow! These are amazing! I did add more lavender to recipe though. Thx!!! These cookies taste amazing!!! For real people, make them!